Gig Bag 50% Off Or Semi-Hardshell Save $30 Or Hardshell Save $30 Bonus Promotion: Purchase an Autoharp by Oscar Schmidt from AutoharpStore.com and you'll have the choice of either 50% off a Padded Gig Bag or take $30 off your purchase when you add on either Semi-Hardshell Case or Hardshell Case. Bonus Promotion: Purchase an Autoharp by Oscar Schmidt from AutoharpStore.com and you'll have the choice of either a FREE Tuner (a $23.00 value) or take $20 off the 3-in-1 Chromatic Tuner. Simply add either tuner to your shopping cart to get your instant savings! Learn more about each product by clicking on the tuner/case images above. This bonus promotion is for a limited time and only while supplies last! What's in a name? Quality, history, and tradition. Our Autoharp is the original, with over 100 years of history behind it. A wide variety to choose from. Oscar Schmidt is truly the original and only complete source for the Autoharp. Premium woods, quality hardware, and modest prices create an ideal instrument. Each is inspected and adjusted in the USA by a skilled technician, your assurance for smooth fret ends, precision low action and resonant sound quality. Unequaled standards, easy playing comfort, and tone response create the perfect value. The Autoharp, like the piano, is a tempered scale, so the same string is used in several chords, even when perfectly in tune in one chord may sound slightly sharp or flat in another. Over time as strings loosen, use fine tuning to tighten so it can reach its limits. The first twang of a string is higher and the tone settles in after a second. Turn the tuner to 442 and attach the clip to the middle peg. Whether you are an Autoharp player, a student of American folklore, or even a collector of antique musical instruments, you should find the history as well as the instrument itself unique. 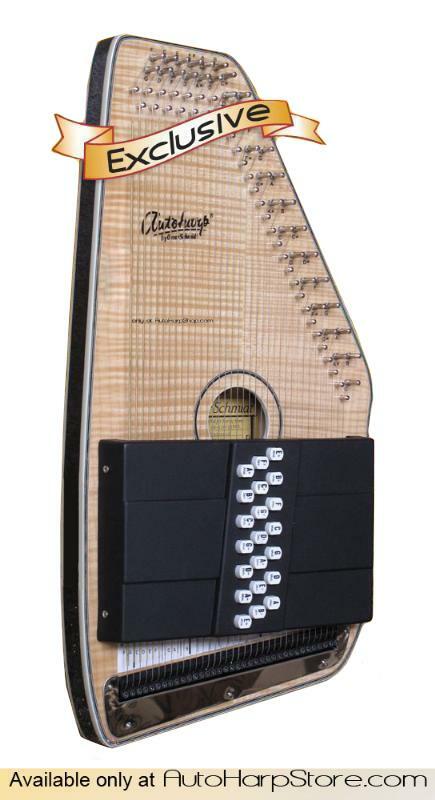 This autoharp is an Autoharpstore.com exclusive. It is the acoustic/electric version of the OS110 21FN. It has all of the features of the OS110 21FN, but it also comes with a pickup, so you can plug it into your favorite amplifier. If you want a top-of-the-line Oscar Schmidt, try this 21-chord Autoharp with a maple top, natural coloring and a fine tuning system. This 'harp was designed with the player in mind. The OS110 features our exclusive FT600 Fine Tuning System combined with a rock maple pin block to assure you will always be in tune. The natural high gloss finish gives this Autoharp a beautiful look. The Fine Tuning System is a must have for the serious Autoharpist. Keep you ‘harp in tune with this featured system. The fine tuning system is installed in this autoharp, a perfect finish for any professional or perfectionist. Although tuning an autoharp can be difficult, the fine tuning system will help get your instrument right in tune. Saves on price and additional labor costs to have the tuner installed at a later time. There are many factors that could change your tune. This fine tuning system is for the professional or serious Autoharp player that wants to keep this Autoharp in great playing condition and in accurate tune. What is the Fine Tuning System? The fine tuning system does not replace the larger tuners at the top of the autoharp. The fine tuning system is a second set of tuners positioned on the bridge of the autoharp. The fine tuning system is used to make minute adjustments in the pitch of the strings. Once you have the string tuned to the right note, you can use the fine tuning system to get the note exactly in tune. This autoharp model comes with the fine tuning system pre-installed. To obtain your desired sound, just use the included allen wrench and make any smaller tuning adjustments as needed. The pin blocks in many of the finest autoharps consist of hard rock maple for extra strength. The pin blocks are laminated rock maple pin blocks meaning they are specially coated for extra strength. The purpose of the pin block is to firmly hold the tuning pins in place where the strings are attached. The added strength of the laminated rock maple ensures that everything will stay in the right place. Multiple layers of maple laminations are cross-banded using a special high frequency, waterproof gluing process. Reversing the grain direction on each layer of lamination yields incredible strength and the high-frequency waterproof glue seals the laminations protecting the pin block from changes in the relative humidity. Our products are brand new and are still in original package. They are stored in our temperature controlled warehouse to prevent any damage or warping. Our first-in first-out inventory system assures that you will receive the newest Autoharp available. We specialize in Oscar Schmidt Autoharps and accessories, so our time and energy is devoted to Autoharps. This allows us to provide our customers with the highest quality service and the best products available. We are an authorized Oscar Schmidt dealer, so you know that we offer the best products on the market. The AutoHarp Store makes it fast and easy for you to find what you are looking for. With our easy ordering system and same day shipping*, it is easy to order and arrives quickly to your door. In order to cut costs to offer our customers the lowest prices, we do everything online. Although most people would prefer to try out a product before they purchase it, by not having a showroom or storefront, we can offer the lowest prices in the market. We have a 30-day money back guarantee if for any reason you are not 100% satisfied. The Autoharp is one of the few musical instruments that can claim to be truly American in origin. Invented in 1881 and patented in 1882, the Autoharp has had a remarkable hundred-year history. After being proclaimed “the nation’s favorite musical instrument” and then nearly fading into obscurity, the Autoharp has taken its manufacturers on an endless roller coaster of ups and downs. As a nineteenth-century parlor room favorite, it was finally replaced in popularity by the phonograph. The Autoharp did not die. It retreated to the mountains where it underwent a metamorphosis from a parlor instrument to a folk instrument. From there it came out into our schools to become a classroom feature and finally, has emerged as a popular instrument for the serious musician. TheAutoharpStore.com is the only place where you can find the OS110FNE, OS11021FHSE, and the OS120CNE. Because of Oscar Schmidt recognizing our dedication to customer service and our product knowledge, we had these models specially made for us and you cannot find them anywhere else.